100% Organic Cotton Scoop Neck Womens Tee Grown and MADE IN USA. Sky Blue Certified Organic 100% Cotton Scoop Neck LADIES Tee - Grown and MADE IN USA. These 100% Organic Cotton Scoop Neck Tee Shirt are a delight to wear, and they get softer and more cozy with every wash, which will keep you wearing it forever! It is dyed with low impact pigment dyes for a mottled, comfy appearance. Soft and relaxed, yet durable and versatile. Great staple for your wardrobe. This Tee is SLIM so it's great if you like a snug fit. These Tees will have minimal shrinkage (approx 3%) so allow for shrinkage in choosing your size. Before you wash it, it will be larger and will shrink minimally after the first wash. Also, they will feel stiff when you first get it, but as soon as it's washed, the softness begins! Soft and relaxed, yet durable and versatile. Great staple for your wardrobe. This will have minimal, about 3%, shrinkage, and we recommend washing in cold water and line drying - and wash with similar color items for the first couple times. Sized for a SNUG FIT, so we recommend you order UP a size. Gender Neutral sizes. Sizes S, M, L, XL, XXL . 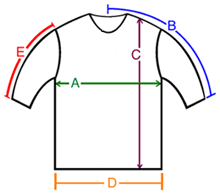 Check our Sizing Chart for measurements of garment BEFORE shrinkage.. Size Guide - Actual Garment Measurements S 28-30" M 30-32" L 35-36" XL 39-40" XXL 44-46"
A: Chest / Bust circumference 33-34" 35-36" 39-40" 42-43" 46-47"
B: Sleeve length from center of neck to end of sleeve 13" 13.5" 15" 17" 18"
C: Body length from shoulder to bottom of hem 21" 23" 23" 24" 26"
D: Hem circumference 34" 36" 42" 44" 49"
E: Sleeve length from shoulder to end of sleeve 5" 6" 6" 6.5" 7"